Today, in the first quarter of the 21st century, visitors to the V & A Waterfront (particularly those who come here to join us on one of our boat cruises that depart from and return to this very same Waterfront) probably don’t give more than a passing thought to the history of this world-class development. They would find it hard to believe that a little less than 500 years ago, the sailing vessels of the Dutch East India Company called at the Cape of Good Hope to replenish their ships before resuming their arduous voyage to the East, en route to Batavia and India. Likewise, none of the sailors who survived scurvy, other diseases that plagued sailors, and the rigours of long hazardous journeys under sail could ever have imagined what would become of the Cape in the future. In 1652, when Jan van Riebeeck arrived at the Cape with his three vessels, he only dropped anchor here, since there was no harbour or development at this southernmost tip of Africa. The Cape’s Table Bay was never a natural harbour. Van Riebeeck’s men built a jetty in 1654, but it was by no means a harbour capable of offering meaningful, effective protection to ships. After all, this area was previously known as the Cape of Storms for good reason. Then, this was no place for taking a leisure cruise. About 200 years after van Riebeeck’s era, in 1858, some 30 ships were completely wrecked in Table Bay by one of the Cape’s infamous, fierce winter storms. Consequently, the world’s principal maritime insurer, Lloyds of London, blatantly refused insurance cover for vessels at anchor during Table Bay’s often turbulent winters. In 1860, Queen Victoria’s son, Prince Alfred, took the first step in creating a breakwater. He symbolically cast a load of stone into what was to become the Albert Basin, which was eventually enlarged into a harbour with the addition of the Victoria Basin by 1920. Sadly, Table Bay Harbour’s dockland precinct had deteriorated immensely to become a harbour that was dirty and an eyesore by the 1970/80s. Moreover, everything was fenced off, allowing no public use or access – a tremendous shame for what had once been one of the world’s most picturesque harbours. By 1989, work on the redevelopment of the V & A Waterfront, which was to become a mixed-use area, comprising retail, entertainment, hospitality, and residential facilities in a working harbour environment, commenced. What better place could there possibly be from which to operate luxury boat cruises? Today’s V & A Waterfront ranks amongst the most beautiful and appealing waterfronts and working harbours in the world – a haven for tourists, leisure travellers, residents, visitors, shoppers, and business people alike. This is the waterfront that our boat cruises call “home”. 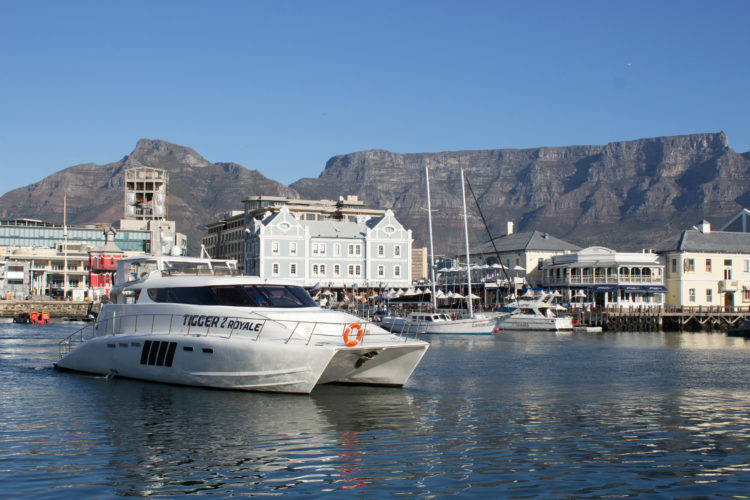 Whether you’re lucky enough to be a Cape Town resident or you’re visiting our fairest Cape, be sure to experience the most scenic cape in the world from an ever-changing perspective – a waterfront boat cruise, made possible by Tigger 2.